EPISODE 32 I want to eat well…but I HATE cooking! In this Thursday Therapy episode, Glenn helps you with how to enjoy cooking more, become more motivated and confident in the kitchen, and find a way to eat nutritiously if you CAN’T see yourself cooking regularly just yet. Welcome to Thursday Therapy. I’m Glenn Mackintosh, the weight psych, and the question we’re answering today is about when you want to eat more nutritious food but you hate cooking it. Welcome to Thursday Therapy where I answer your questions on the psychology of eating, movement, weight and body image every two weeks. Guys, before we start, let’s address the elephant in the room, what is with this moustache? The truth is, I don’t know, it’s really hard to shave this area of my face because the hair is so thick, so I always leave it to last, a couple of weeks ago I thought, I’m just going to leave it, but I knew that I was going to keep it on for today because today’s Thursday Therapy question comes from, Joel, he’s a dietitian from Melbourne and he’s the first person who’s a bloke who’s asked a video question on Thursday Therapy, so I thought I’d keep it kind of manly, so Joel what’s your question, “Hey Glenn, as a dietician, I meet a lot of people who don’t enjoy cooking and had very little culinary skills. I’m really keen to get your thoughts and what type of advice you give to those types of clients and also, I can’t wait to see you rockin’ out in your get-your-man-in-the-kitchen apron.” Joel, this is a really great question, mate. I’m really glad you asked it, this is one of the fundamentals for me and it’s something that a lot of people struggle with but we don’t always address and it is a big issue. You know, you guys know I don’t talk too much about weight management but we do know that people who eat out or get takeaway more than a few times a week they do tend to really struggle with their weight and the flip side of that is that if we actually encourage people to eat more nutritious foods and cook more at home they naturally start to eat less of the other stuff. So, for me, this is a really key skill, so let me get to giving you my thoughts. So, my first thought is actually really simple but it’s one that we’ve often overlooked and that would be to learn a bit more about cooking. Joel was right, he mentioned a lack of enjoyment and lack of culinary skills in the same breath and that follows basic psychology. What we’re not confident at we don’t feel motivated to do, and how do you increase your motivation, you become more confident, how do you become more confident, you do it, you learn, you practice, you refine. I can’t count the amount of clients that I’ve had that have hated cooking then with some pretty simple skills in a pretty short timeframe, it’s gone from a real chore just to a daily life task and to some of those people a real pleasure. The second thing that I want you to think about in your journey to developing a healthier relationship with the kitchen is that you don’t have to go it alone. There are lots of people that can support you, for a start follow, Joel at Hardy nutrition, he is one of a new wave of dietitians and nutrition professionals that are putting the fun back in food. Follow people like him, both people like Jamie Oliver, there are countless people out there that can help you have a different relationship and see food and the preparation of food in a different way. It’s not going to be that exciting for you if nutritious eating is boiling broccoli and lean chicken breast with a tall glass of ice water. So, make sure that you expose yourself to a group of people who are really interested in nutrition but really interested in the pleasure in food. You might even want to get one of those people to support you individually, so I know that Joel does cooking classes, we’ve got some dietitians a tree of life nutrition who run cooking classes, I have a great referral in Allison Lee from nourish table who goes with my clients and teaches them to cook one on one and once people learn these skills and not only the skills the attitude that comes with it, food prep is a whole different story. Okay, my third thought I don’t know what you guys are going to think about this but it’s if you can’t win, cheat. I’m a big fan of being practical rather than being ideological when it comes to eating, movement, weight and body image and the reality is that probably the gold standard is cooking for yourself most of the time but there will be some people I know watching this just saying, Glenn I get it, but I’m just not there. I get all those ideas that you are saying but I just can’t really deep down see myself doing it for now. So, what I would say to you is, let’s accept that reality for the moment and find a way that you can eat more nutritiously without cooking for now. So, you might like to get something like light and easy or you-foods, you might like to get pre-prepared foods from the supermarket like Lean Cuisine or Weight Watchers. I’ve even had real success with a couple of my clients getting someone in who comes in to cook for them, so I suppose what I’m saying is if you really know deep down you’re not there yet, find a way to make it work but rather than seeing that layers as the be-all and end-all, let’s view it as a stepping stone to get you eating a bit more nutritiously, eating a bit more regularly and something that’s going to take you on the path to eventually cooking for yourself. So, in the vein of trying something new and getting support and making it work in a way that’s right for you, I want to let you know about Joel’s campaign, get your man in the kitchen. Joel is a dietician who specializes in men’s health and he also specializes in non-dieting, both of those are quite rare things, so Joel I’m pretty sure you’re the only men’s dietitian specializing in men’s health from a non-dieting perspective that I know and I know a lot of dietitians but having said that, the campaign is not just for men and it’s a really simple and I want you all to take part of it. So, what you do is you prepare some food and Joel would suggest you might try an old favourite with a more nutritious twist, something completely new, anything that gets you eating deliciously and nutritiously. 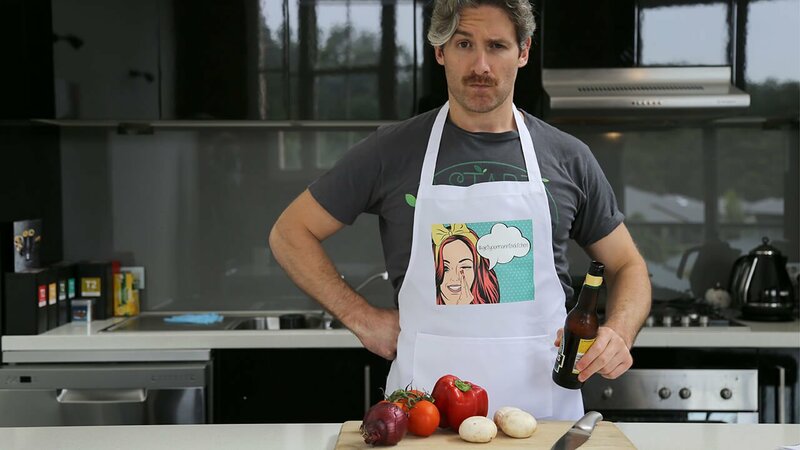 Take a photo of yourself, preferably with a cheesy apron of some sort on and then hashtag – get your man in the kitchen. I t’s for men and for women and when you do, I want you to tag Joel and I, so we can see, I’m even going to add my own post on Instagram soon. So, Joel thank you for your question. Guys, I hope they’ve been some ideas in there that you’ll enjoy and benefit from, if you haven’t subscribed, what are you doing, subscribe for regular sessions with me. We’re doing a video a week now with the Thursday Therapy’s one week and the coffee breaks the other week, so you’re going to get something every week and until I see you next time, happy cooking. Hey Buddy!, I found this information for you: "EPISODE 32 I want to eat well…but I HATE cooking!". Here is the website link: https://www.weightmanagementpsychology.com.au/episode-32-i-want-to-eat-wellbut-i-hate-cooking/. Thank you.